Huperzine A 200mcg 60 caps. The effect of huperzine is felt after 15 minutes and lasts around 12 hours. The recommended daily dose of huperzine is 100-200 mcg. It is best to take it during the day and only on those days when we are required higher intellectual efficiency. One higher dose and two smaller may be taken during the day. In order to improve sleep quality and cause the effect of conscious dream, it is recommended to take a standard dose 30 minutes before sleep. 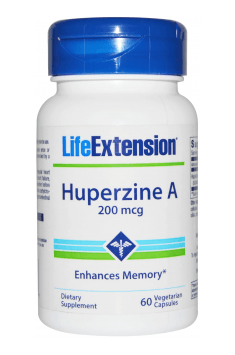 Do not take huperzine before sleep regularly, as it may cause problems with falling asleep. In case of long-term prophylactic supplementation, tolerance to the substance increases and in order to feel the „brain boost” again, a break in application should be taken (e.g. one week per month). Toothed Clubmoss (Lycopodium serratum; Huperzia serrata) is an Asian plant containing Huperzine A. Huperzine A is an alkaloid having the ability to penetrate the blood-brain barrier, which is a negative catalyst for the degradation of acetylcholine, that improves nerve courseion and having a significant impact on the concentration, cognition and memory, it is a strong antidepressant. In the sports supplementation it is recommended when courseing intensive trainings and during sports competitions that require high concentration and memory. It is a component stack and pre-workout no-boosters and herbal remedies having a similar effect.